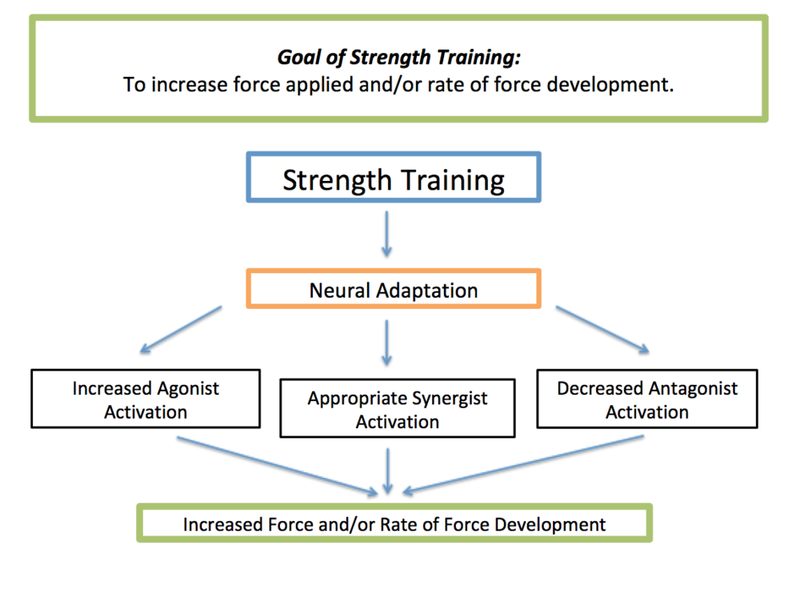 The goal of strength training as a whole is to increase the force applied (how much force) through a movement and/or to improve the rate of force development (how quickly we move). But the muscle is only responsible for the final output of this. The neuromuscular system (the connections between the brain and the muscles) is largely responsible for innervating muscle fibres and producing coordinated motor patterns. 'Neural Drive' refers to the motor unit recruitment within the muscle fibres caused by the nervous system sending electrochemical signals to activate and enable contraction of the required musculature. The way in which this process is enhanced via strength training is highlighted below and the result of neural adaptation is an increase in neural drive. Simply put a greater ability to activate only the required muscles. Image 1 - Summary of how strength training develops greater neuromuscular pathways. + Synergist Muscles = the assisting muscles to help create the movement or stabilise the joint (i.e. abdominals assist the stability of the hip). Without correct innervation (activation) of the appropriate muscles during activity we are limiting our output potential. Think about having the handbrake on in the car and attempting to drive. The car may still move forwards, but the handbrake limits the output whilst burning up a large amount of fuel. Taking off the handbrake the car accelerates forward with far less effort, we are efficient and begin to open up far greater performance potential. The only way to achieve this is teaching the body to move correctly by performing controlled repeated motor patterns that aim to develop connection between multiple joints. At the end of the day, endurance sports are whole body, multi-joint movements. We must have a clear connection between these joints, particularly the hip, knee and ankle to produce the most economical motion possible. With this information we can begin to release the handbrake on our movement ability and begin to generate more economical use of the body. Think more economical running, swimming, cycling, rowing etc. Same output, with less energy or effort. Spend time on the big ticket items that are multi-joint, complex movements. Think about learning a sound squat and deadlift technique for the lower body, a quality push up/bench press and row/pull up pattern. Obviously don't neglect the "core" muscles including the gluteal muscles to maintain stability of the hip and provide a platform to transfer force from lower to upper body and back. There is a time and place for accessory or isolation exercises including calf raises and hamstring curl/nordic hamstring variations . BUT, these are not the bread and butter and time is better spent on the exercises and their variants listed above. Always perform the big ticket items first in a single session before completing the accessory exercises. Larger compound movements require greater expenditure and therefore will fatigue you more quickly. As a side note, performing isolation exercises first will fatigue that individual muscle (i.e. calf raises will fatigue the gastrocnemius and soleus) thereby compromising the use of the calf complex during squatting and deadlifting. This will significantly influence your ability to perform the movement. As for specificity. I re-iterate a point I made at the beginning of this post. Being specific to your sport does not mean doing the same action, the same number of times just with resistance (i.e. single leg cycling in a heavy gear or running hills till exhaustion). We can get a far better stimulus from much simpler, safer and more effective exercises while also minimising the recovery process. A single leg squat or Bulgarian split squat when loaded appropriately will provide a great improvement in lower body strength for running performance, whilst loaded hip thrusts or glute bridges will greatly improve hip extension translating to great power output through the pedals for cycling. Image 2 - The Bulgarian Split Squat. Sets & Reps aren't the extent of training variables to be manipulated in strength training. We can also consider rest periods, intensity (weight lifted) and tempo of the movement. However to be able to build neuromuscular pathways the best place to start is with learning to perform a movement correctly. This is where a qualified S&C coach is critical in assisting the learning process. Nailing a perfectly executed squat at body weight for example, is a far more positive stimulus on the body than heavy loading of a poor technique. Risk vs. Reward, if performing a heavy loaded movement is going to put you at an increased risk of injury due to technique breakdown, it's not worth it. Strength is a supplement to the endurance athlete training regime, not the number 1 contributor. Beyond this, aiming for 1-3 sets of 1-8 reps per exercise with a load of body weight for beginners and between 70-90% 1RM (RM = Repetition Maximum) will specifically develop muscular strength. Remembering back to the goals of strength training, muscular strength will greatly contribute to increasing the force output of the muscle. In both cases aiming for a rest period of between 2-4mins between sets is ideal for allowing adequate recovery and greater focus on the neuromuscular benefits rather than promoting muscular damage and ultimately hypertrophy (gain of muscular size). For athletes beginning to reach a strength peak or whom are capable of translating that new force into a performance setting, targeting muscular power development is key. This is now talking about the rate of force development. Here we aim to achieve 1-3 sets of 1-5 reps at a reduced intensity of 40-55% 1RM. The sole intent throughout any compound lift (i.e. squat, deadlift) however, should be to lift as quickly as possible. This engages that neural drive to fire at a higher rate and provide a greater neurological stimulus on the body. The beauty of this technique is you don't need to be lifting outrageously heavy to do this. Simply doing a classic vertical jump for maximum height is an example of moving with the intent to be fast. Strength and resistance based training has been shown time and time again to provide improved muscular function, speed, strength and endurance as discussed above. However chronic strength training has also been closely linked to increased bone mass (attenuating bone mass loss over time), increasing muscle cross-sectional area (decreasing muscle loss over time), reduction of body fat (critical in body composition - think key component of relative VO2max and general health) and the reduction of common pathologies including lower back pain, knee and joint pain and soft tissue injuries (tendinopathy, muscle tears etc.). Stronger bones, muscles, tendons and a more greatly developed nervous system will all contribute to the enhanced ability to coordinate and control bodily movements in space and therefore increase the body's ability to correct and adjust to protect against potential injury influences. For example, being able to stabilise the knee through stronger quadriceps will enhance the durability of the patella tendon and ultimately fight to protect against "runners knee" type injuries. Ultimately the more time you spend injured, the less time you have to train and compete at what you do best, whether that be swim, bike, run, kayak, row or a combination of these. If the body is strong and robust it will be able to more easily tolerate the loads we attempt to throw at it. I have not met a single athlete who has enjoyed being injured. So why not get on the front foot and begin to prevent an injury from occurring in the first place. It is far easier to develop good strength training habits and build a well rounded and strong athlete pre-injury than it is to re-hab and start again. I know which side of the fence I'd like to be on. + Strength training is more about the neuromuscular than it is about the aesthetic or size gain. + The goal is to develop the nervous system for enhanced force output and rate of force development. + Strength is a supplement to our training, it is general preparation of the neurological pathways and NOT simply your endurance activity loaded with resistance. + Injury prevention will lead to performance outcomes, less time injured = more time training and competing.